Brother Nolan THE APOSTASY NOW! 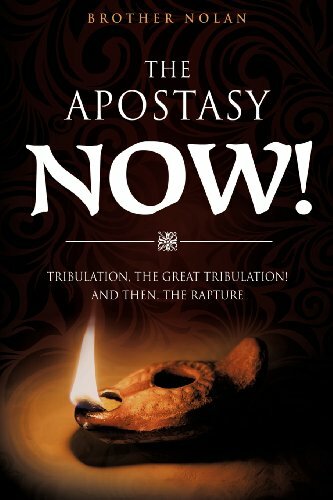 Those who say "Rapture before Tribulation" are in effect saying "peace and safety"! And therefore, you being a foolish virgin, with not enough oil to light your lamp for the breaking of the first six seals, shall these same seal judgments come upon you for your destruction, "...suddenly like birth pangs upon a woman with child and they shall not escape", I Thessalonians 5:3. Can you put your finger on the order of events Christ gives us in Matthew 24:3-31? See also the Apostasy and the "man of lawlessness", both come before the rapture. Read: II Thessalonians 2:3. See order of events: Daniel chapter 12, Revelation chapters 6, 7, 13 and 14. Remember, there is only one harvest or rapture. Make ready ye saints in this; "The Laodicean Apostate Church". We must pass through the tribulation for the trying of our faith; for the separating of the wheat from the tares, or the five wise from among the five foolish virgins. Do you have enough oil to endure unto the end? Or will your lamp go out? Try some of my oil; For "my cup runneth over!" Please! Read on... After the Rapture, then comes the Wrath of God on the Foolish Virgins! Next: Tormenting wrath on Anti-Christ followers of all nations, as the elements become increasingly toxic. Then Anti-Christ armies suffer greatly! Now comes all the armies of all nations to join satan, the beast and the false prophet, to battle Israel and God's armies from heaven; for "The Last Great Battle" "The Battle of Armageddon!" Next: "The Millennium," "The Second Death", "Lake of Fire..."